8 April 2010, at 3:52a.m. 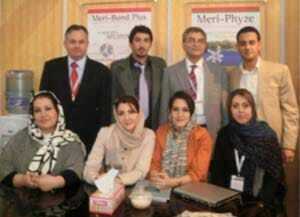 IRAN - Meriden was represented by their distributor Hazar Teb Tehran at the 2nd International Veterinary Poultry Congress on the 20 to February 2010 in Tehran. Hazar Teb Tehran is one of Meriden's longest standing distributors and the Meriden products, Orego-Stim, Meri-Phyze and Meri-Bond are available throughout Iran via them and their sub-distributors.